UML Timing Diagram in the UML 2.0 is a specific type of Interaction Diagrams that describes the timing constraints. UML Timing Diagrams describes the behaviors of the objects during a certain period of time. UML Timing Diagram is an inverted form of a Sequence Diagram – the axes are reversed thus the time is passing on the x-axis from left to right, and the different components of the system which interact with each other are arranged on the y-axis. To design a Timing Diagram use the UML Timing Diagram library. 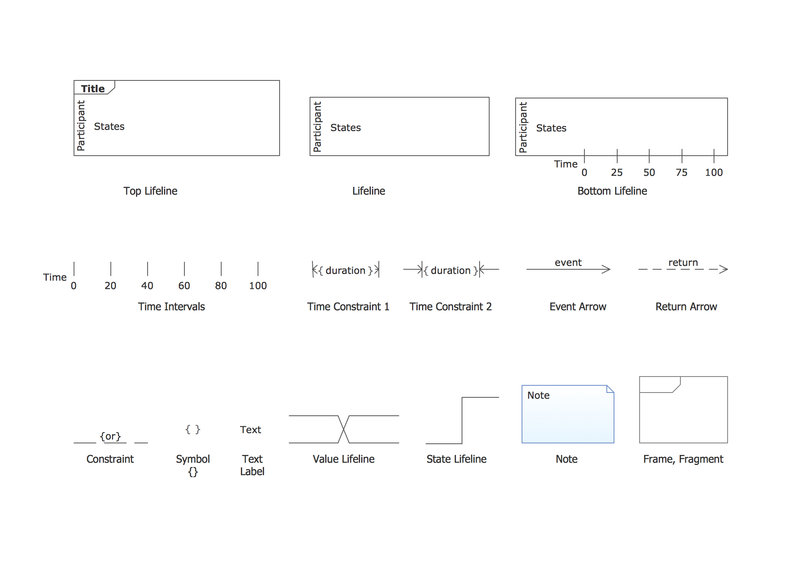 ConceptDraw Rapid UML solution provides UML Timing Diagram library of vector stencils for drawing the timing diagrams using timing blocks and assembly connectors. Use design element from the UML Timing Diagram library to draw your own UML timing diagrams of complex systems and software applications. UML Timing Diagram as special form of a sequence diagram is used to explore the behaviours of objects throughout a given period of time. UML Composite Structure Diagram shows the internal structure of a class and the possible interactions at this structure. ConceptDraw has 393 vector stencils in the 13 libraries that helps you to start using software for designing your own UML Diagrams. You can use the appropriate stencils of UML notation from UML Composite Structure library. Using ConceptDraw you will be able to create bubble diagrams from the ready ConceptDraw library objects or make your own objects. The created diagram can be saved and edited, objects can be moved and links between them will be automatically repainted after object moving because of using the ConceptDraw connectors.